So like, things are getting a little crazy around here. I'm running out of room in the freezer for cookies. And pierogi. But mostly cookies. I'm probably making too many cookies for the holidays (I can't believe I just said that), but there are certain cookies that just make it feel like Christmas time to me. My mom always used to make these sugar & spice cookies around this time of year. They were special "Christmas time" cookies in my little brain, and I don't remember eating them any other time of the year. Now my Christmas cookie baking marathons just don't feel complete without them! They're good too. Real good. Slightly crisp on the outside, but chewy in the middle. 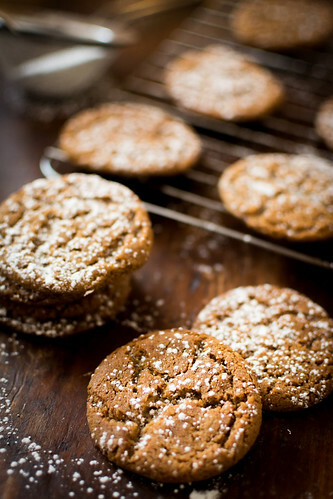 There's depth from the molasses, and just the right amount of spice without getting too gingerbready. The recipe calls for shortening, but I have used butter with good results as well - just slightly crisper and the cookie will spread more. The dusting of powdered sugar is totally not optional, by the way. It's Christmas, ok? Everyone needs a little snow in their life! 1. Preheat oven to 375F. Line 2 baking sheets with parchment paper. Position your oven racks in the top and bottom thirds of your oven. 2. In a large bowl, sift together the flour, baking soda, salt, cinnamon, cloves and ginger. set aside. 3. In the bowl of a stand mixer cream together the shortening and sugar with the paddle attachment until light and fluffy. Beat in the eggs one at a time, and then the molasses until well combined. Add the dry ingredients and mix until a uniform dough forms . Be sure to scrape the sides and the bottom of the bowl while mixing - this is a large amount of stiff dough and dry ingredients like to pool at the bottom of the mixer. 4. Roll the dough into small bowls about the size of a tablespoon and place on the prepared baking sheets about 2 inches apart. Bake for 10-12 minutes, switching the baking sheets between racks halfway through, or until the cookies are puffed and slightly cracked all over. Remove from oven and let cool on the baking sheet for about 2 minutes before cooling completely on wire racks. Repeat with the remaining dough. 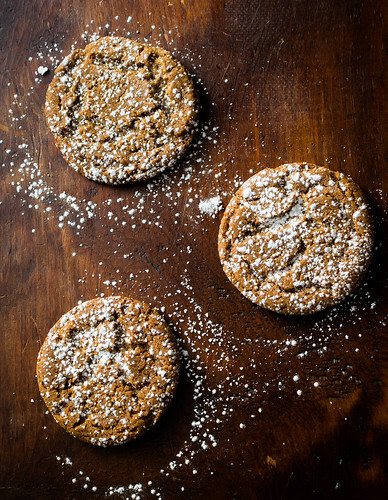 Once the cookies are completely cool, dust lightly with powdered sugar.